If you are fascinated with days gone by and how things used to be, Suffolk is one of the best places to base your Historical Break. It has links to the past displayed by its ancient towns, preserved ancient houses, castles, town halls, factories, barns, parish churches and bridges across the entire county. To truly experience a taste of history one needs to stay overnight in one of Suffolk's hotels or accommodations - and there are a great many to choose from! 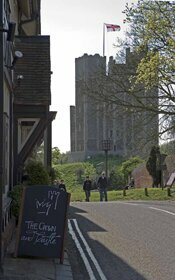 The Crown & Castle, Orford, dates back to the 16th Century. The original inn was built into the walls of Orford castle, and the remains can currently be viewed from the relaxing terrace - a magical sight indeed. 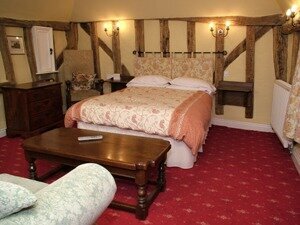 This mostly Tudor, part Medieval hotel combines an historic Hotel with modern accommodation. The Abbey Hotel is a relaxing and convenient place to stay, popular among both the business community and leisure visitors to Bury St Edmunds. The Great House, Lavenham, was a private house in the 1930's until it was transformed into a Boutique hotel in 1985. Built during the wool trade, it actually appears more Georgian than Tudor due to extensive renovations in the 18th Century. Tuddenham Mill, Tuddenham, was once a traditional water mill and has today been respectfully converted into a chic and boutique hotel with luxurious bedrooms that come complete with walk-in showers, over-sized, double-ended stone baths (big enough for three! ), exclusive toiletries by Jo Malone, Italian designed and sourced furniture, extra large pillows and fine Egyptian cotton bed linen. 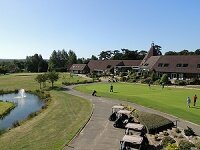 For more information on English Heritage and Hostorical Breaks, please see our articles on Heritage Short Breaks in Historic Suffolk Hotels and English Heritage in Suffolk. Have you been on an Historical Break in Suffolk? Please tell us all about it by sending us a review at suffolkguides.admin@suffolktouristguide.com.